As a resin bonding, Ceplax Wheel which adopted the super heat-resistance resin which can bear up to about 500ºc and as diamond and CBN grinding wheel, it has a great capability to cut the hard-but-brittle materials and manufacture the high quality materials. It’s suitable for the process which can cause grinding heat from cutting the hard-to-brittle materials and grinding in dry setting. Metallic heavy grinding materials, Re-polishing of Tungusten carbide drill. 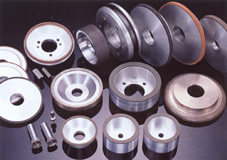 Ceplax Wheel is a resin bonding material which is super heat-resistant resin and outstandingly durable.Conventional phenolic resin bonding grinding stone has been poorly performed under the heat and mechanical strength, and when in heavy grinding, its performance to grind lowers as deterioration by heat progress.However, Ceplax Wheel is designed and manufactured to tolerate under the high thermal conditions and shows outstanding performance even under the heavy grinding process. Applicable for heavy grinding process ----- High-efficient grinding process with faster speed performance and precisely cutting. Capable of dry grinding process. Long lasting life to grind. Reduction of the cost of grinding process over all.